Apple today released a new version of the iTunes 12 beta for both developers and OS X Yosemite beta testers, following Monday's release of the Yosemite Golden Master Candidate and a fourth public beta. First introduced in July, iTunes 12 includes an "elegant new design" that also includes support for several iOS 8/Yosemite features, including Family Sharing. Apple has released three iTunes beta updates thus far, fixing small bugs and other issues. This newest beta includes new top bar icons in preferences with an iOS-style design and stoplight buttons that have been moved back to the center. 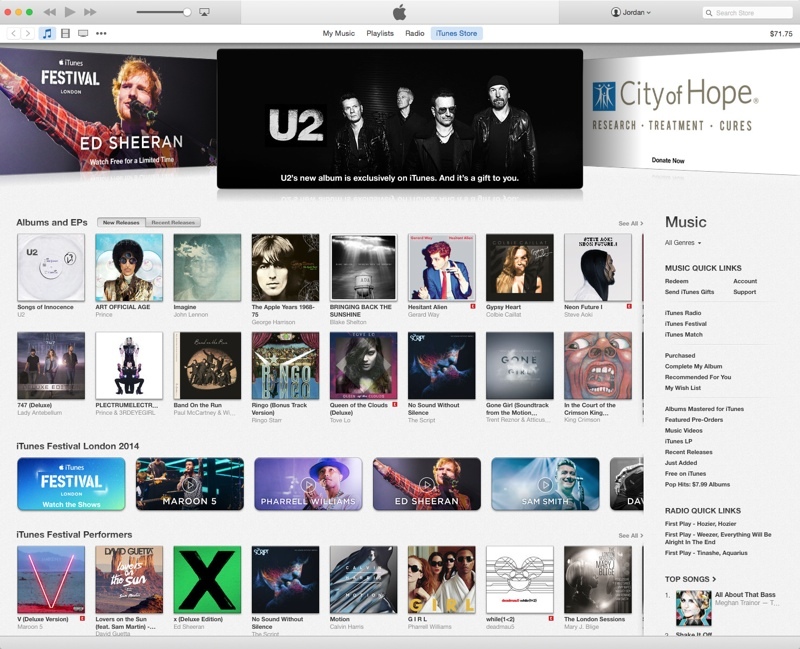 iTunes 12 also includes improved playlists, a redesigned Info Window, and a new icon. Both iTunes 12 and OS X Yosemite remain in a beta testing phase, though a public release for the software is expected in October. UI changes are getting sparse. Vertically-centered window controls for the win! iTunes is nice and all, but my god is it bloated. I must use like 10% of its features. Already played with it. I hate it. I might not hate it if it actually worked. Like, ever. Once you look at a CD (in my case) you can't look at your playlists, music, or anything else again without quitting and re-opening. That's strange. I don't have that issue. Everyone says that. I must just be a massive media consumer, cause I feel like I use pretty much all of iTunes. Am I the only one that finds the new UI without sidebar really inconvenient to actually use? I think "sarcastic" is the word you are looking for. Windblows just went from 8 to 10. No release date in the list view, and a really dumb release date in the info window. Apple keeps changing the UI, icons and adding some gimmicks, keeps bloating the application up, while ignoring the glaring inconveniences, long-standing bugs and lack of organizing-related features. Can't remember the last version that was actually better than its predecessor. And don't get me started on the icon itself. Still using this one. I still can't get used to the vertically-centered "traffic light" controls. It introduces inconsistency when moving from one app to another. They need to just start again. The interface is terrible, it was designed for music, not books, movies etc. Why the hell is it still called iTunes? Tunes is only part of what it does (badly).